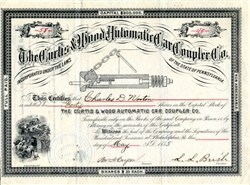 Beautiful certificate from the The Curtis & Wood Automatic Car Coupler Company printed in 1885. This historic document was printed by the Lehman & Bolton Company and has an ornate border around it with a vignette of the company's coupler device. This item has the signatures of the Company’s President, and Treasurer, and is over 126 years old. Li Noineees' Club Of Philadelphia—Record JjJ Of Regular Meeting, March 21st, 1885. —President J. J. de Kinder in the chair. Mr. E. S. Hutchinson proved geometrically that the well-known Latitude and Departure Method of Calculating Areas was true for all positions of the assumed axis or meridian, provided due regard be had to the signs; from which it was obvious that tedious computations could always be very much shortened by conceiving the meridian to pass through a convenient point within the area, instead of through the most easterly or most westerly point, as given in the books. The company claimed that its coupler insured absolute safety in coupling and uncoupling cars, a great saving of links and pins, and much time in making up trains; that it can be applied to cars with little or no greater cost than the ordinary draw bar, which, in fact, is used, provided with an automatic steel hook instead of the ordinary pin, which hook has about double the strength of the pin now in general use; that it has all the advantages of the present link and pin coupler as to coupling to the ordinary draw-head or any other having a link or provided with a pin; that it can be applied to any freight car without changing the ordinary draught rigging, bolt or springs; that accuracy of coupling with the links in any possible position is assured by the construction of the bull-head throat, which guides the link when forced backwards to the proper position. When it is desired not to couple, the uncoupling lever (at outside end of end sills) is thrown up, thus placing the crank in an opposite position and making it impossible to couple. History from OldCompany.com (old stock certificate research service) and WWI Liberty Bonds Buyer.